Saul Kripke is one of the most important philosophers of the twentieth century. His most celebrated work, Naming and Necessity, makes arguably the most important contribution to the philosophy of language and metaphysics in recent years. Asking fundamental questions – how do names refer to things in the world? Do objects have essential properties? What are natural kind terms and to what do they refer? – he challenges prevailing theories of language and conceptions of metaphysics, especially the descriptivist account of reference, which Kripke argues is found in Frege, Wittgenstein and Russell, and the anti-essentialist metaphysics of Quine. the continuing importance of Kripke's work to the philosophy of language and metaphysics. 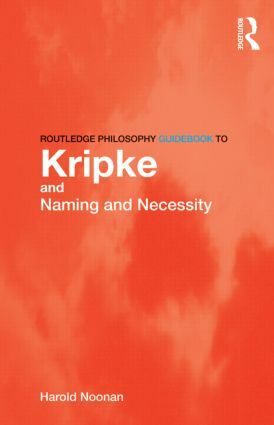 The Routledge Philosophy GuideBook to Kripke and Naming and Necessity is an ideal starting point for anyone coming Kripke's work for the first time. It is essential reading for philosophy students studying philosophy of language, metaphysics, logic, or the history of analytic philosophy. Harold Noonan is Professor of Philosophy at the University of Nottingham, UK. He is the author of Hume on Knowledge (1998), and Personal Identity (second edition 2003), both available from Routledge.